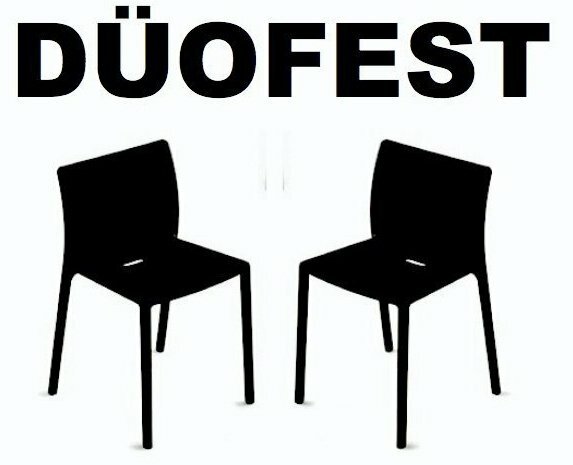 Tonight marks the start of the first ever DUOFEST, hosted by the PHILLY IMPROV THEATER and taking place at the Shubin. This weekend explores the joys of duos… two person improv that until now has never appreciated this level of attention. Kudos to the producers for locking in on a unique theme and creating a playspace for this abundant but underdeveloped corner of the improv world. Audiences have four days of twosome love to take in, and there’s a lot of talent that’s going to be represented on stage through the weekend. You’re likely familiar with a lot of the local ones… the longtime partnership of Whipsuit, the organically fresh Amie & Kristen Show, the one-man duo with an audience member M@&, the newly retitled Rosen & Milkshake and even an old school reunion of Holmes/Maughan. All of the acts promise to be excited and fun-filled, but because weekend passes are long since sold out and I love lists, I’m giving you my picks of new, exciting and different duos you may not know about but probably want to make a point of checking out this weekend. Kicking off the list and performing tonight are Toy Soldiers. These are two local improvisers very dear to my heart, not only because I’ve played with both of them regularly through the years, but more so because I’ve been in the audience watching them. They’re individually fun to watch, and I’m really excited for the debut of them together in a premise that plays exceptionally to their strengths. Closing out opening night is this duo from Boston. As the title might suggest, one is gay and one is straight, but most importantly, both are hilarious. I’ve been able to play with Steve on numerous occasions, and he’s always a delight. Although I haven’t climbed on stage with Dana, he’s a joy to watch and makes some surprising choices. I’ve been waiting to catch them together in this show, and tonight I finally get to. Rick is a Duofest producer and brings with him a long history of improvised stage work, starting out at ImprovBoston and continuing up through his current work with Magnet, where he met Jenny. Although she’s newer to the craft, she’s had the opportunity to dive in and train with some of the best NY has to offer. Now watch as these two carefully explore the nuances of perspective and change, reliving a single moment over and over, discovering how subtle choices define consequence. A father-daughter act that is as quick and clever as it is adorable. They brought the house down and wowed audiences at PHIF last year, and since that time have been on a streak, killing stages at festivals all across the country. Anyone that has any doubts about Jessica’s age surely hasn’t seen that girl take on solid adult personas and bust out shadow characters with the best of them. Truly a unique show not to be missed. It’s no secret I’ve had an improv crush on Marcy for years, from her days conquering UCB’s Project Improviser, clear up to the present, as her all-female ensemble Bombardo continues to be a highlight of PHIF each year. In this show, she reunites with Megawatt Team X co-star Rob (sending out some Imposters love) for a duo that’s sure to be filled with strong characters and bold moves. One’s part of Improvised Shakespeare and The Reckoning. The other created Storybox and runs CIF. These are two Chicago greats, just doing what they do best. Sit back and soak it in. Local audiences may be familiar with Asaf and his work he’s brought to Philadelphia in the past. A wonder on his own, when you put Karen in the mix for IMP, you get something that really jumps a few levels. Mostly devoid of spoken words, this commedia inspired clowning duo communicates more effectively with glances and gestures than many improvisers could hope to do with an arsenal of verbal language. Fluid character archetypes, combined with often poetic and always hypnotic visual storytelling creates something that isn’t improv… because it defies description. This duo are married to the stage and to one another. Both Second City Alums, both determined to show California how it’s done… first in San Francisco and now taking up residence in LA. 25 years improvising together is no small feat, and here’s a rare chance for folks on the east coast to see what that kind of shared skill, knowledge, intimacy and trust can create on stage. Two fantastic and funny people who NY is very fortunate to have. They won Magnet’s Improv Duo Tournament in 2009. They won my heart long before that. I’ll be honest that I’ve heard nothing about this show, nor am I familiar with the improvisers. But the show description alone has my interest genuinely piqued. Closing out Duofest, these ladies play awkward, quirky pre-teens living through a single day of school. Nostalgia and cringing humiliation are apparently on the lesson plan, and attendance is mandatory. There are dozens of other acts running throughout the weekend, and you can get the details on all of them on the Duofest website.